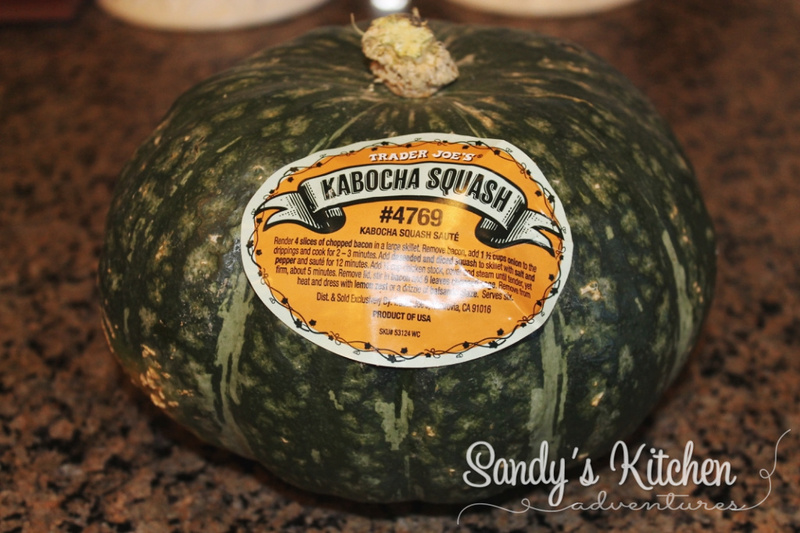 I am fairly new to kabocha squash but man oh man... where has it been all my life? I have absolutely fallen in love with it! Why? It tastes quite similar to some of the foods I can not have on the Medifast plan... like butternut squash, pumpkin and sweet potatoes. Oh yes! I do miss my sweet potatoes! All the things I love and miss, especially during the Fall season! That doesn't mean I can never have them because they are introduced later during transition and maintenance. Not that they are bad for you because they aren't. They are actually very healthy, but they are higher in carbs. I will say that there are quite a few veggies I would have never tried if I wasn't on the Medifast plan so I am thankful for that. Kabocha squash is an Asian winter squash commonly known as Japanese pumpkins. It is slightly sweeter than butternut squash, but it has a less calories and carbs. 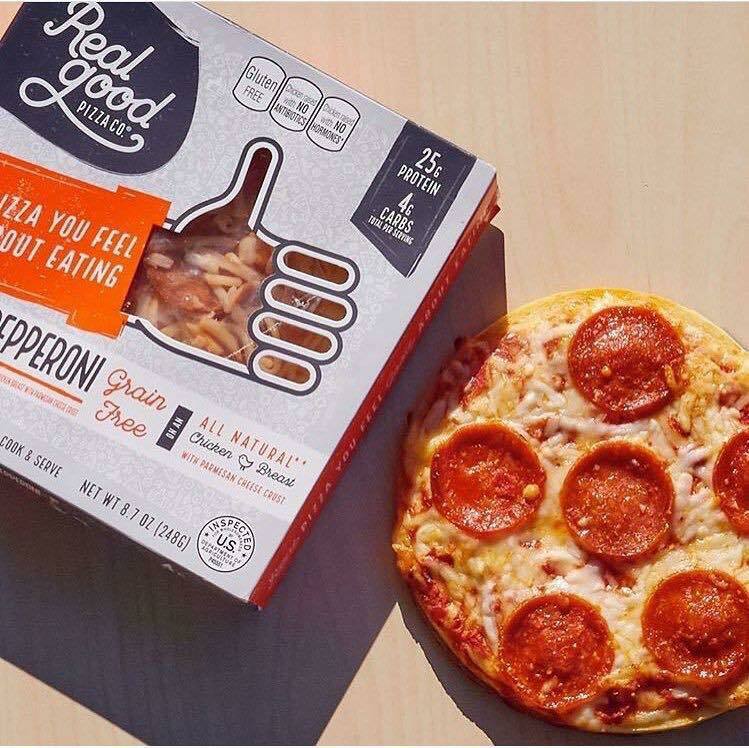 One cup is only 40 calories and 7 grams of carbs! 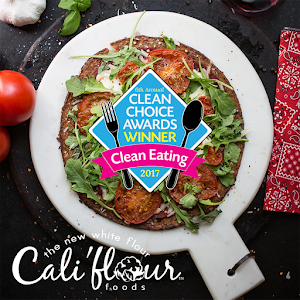 A great veggie for the low carb lovers or those trying to watch their waistline! Not to mention it has lots of beta carotene, iron and vitamins! The taste and texture is a combination of both pumpkin and sweet potato. 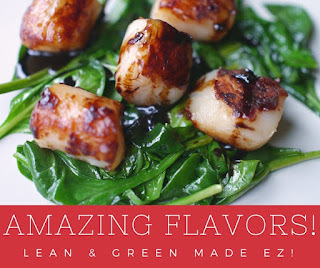 Pretty awesome marriage of flavors going on! 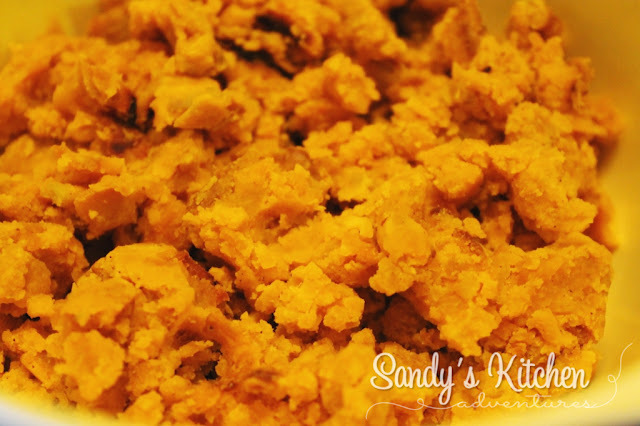 That is why this squash makes a wonderful substitute for "pumpkin" pie and it works so well for the recipe below. But wait... where do I find this yummy tasting veggie? 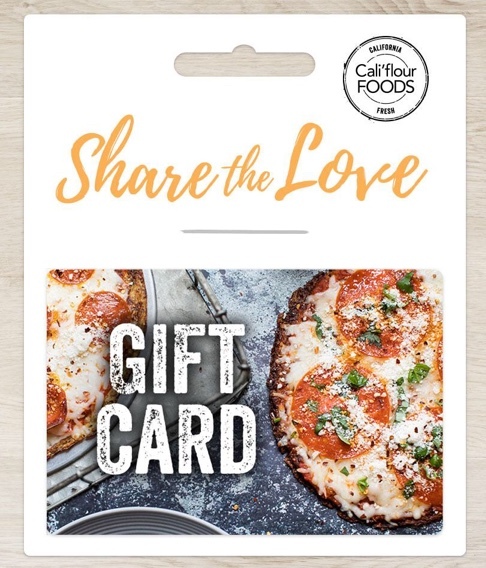 I had no problems finding it at my local Trader Joes. They had tons for $2.29 each! I haven't seen it at two local regular grocery stores, but I didn't check all of them. 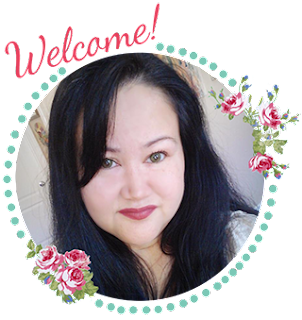 I have heard that they can also be found at local Asian markets (sometimes year round) and local farmers markets. Again, I am fairly new to this squash so I haven't really been searching a long time for it and I am lucky to have a Trader Joes by me. They are usually available in late Summer to early Fall and can be stored in a cool dry place up to one month. You can extend the life of the squash by freezing it. 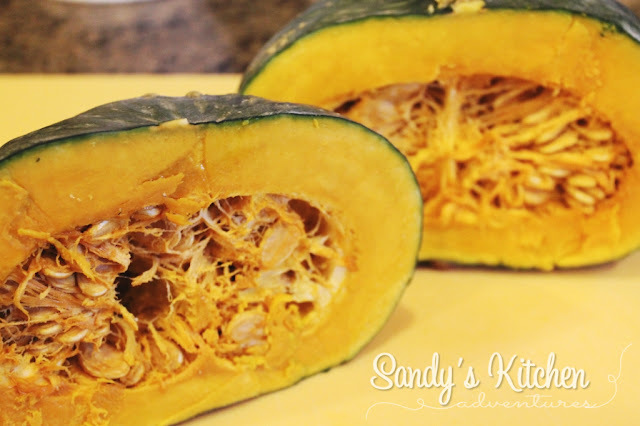 Check out this site for Ways to Freeze Winter Squash. 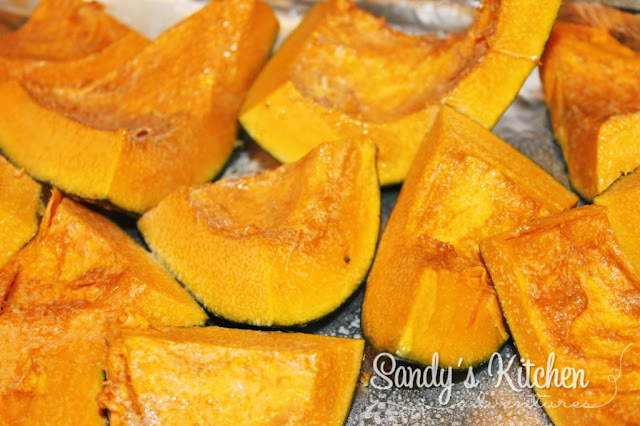 Try to use plain frozen kabocha squash within 3 months. The outer layer of kabocha squash can be really tough to cut through. 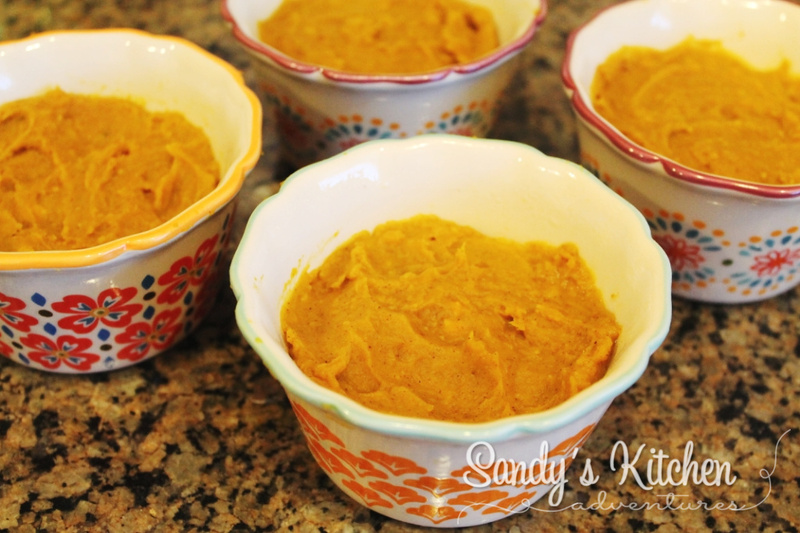 Microwave the squash for about a minute or two to soften it up some. Use a large sharp knife to cut the squash in half. You are really going to have to work at it to get that sucker open. It may help to cut the stem off at the top and then slice through the squash. Cut the squash into wedges. You can leave it as wedges, but I took it a step further and cut the wedges in half. Also, you can cut or peel the skin off before baking, but I chose to do it after baking since it was easier. Place the pieces on a baking sheet lined with non-stick foil. Spray non-stick cooking spray on the squash. I used coconut non-stick cooking spray, but whatever kind will do. Roast the squash for about 30 minutes and then flip the squash over and roast for another 15 minutes or until softened. Let cool. Once cooled, cut or peel the skin away from the wedges and put the squash in a bowl. Measure out 2 cups for this recipe and store the rest. 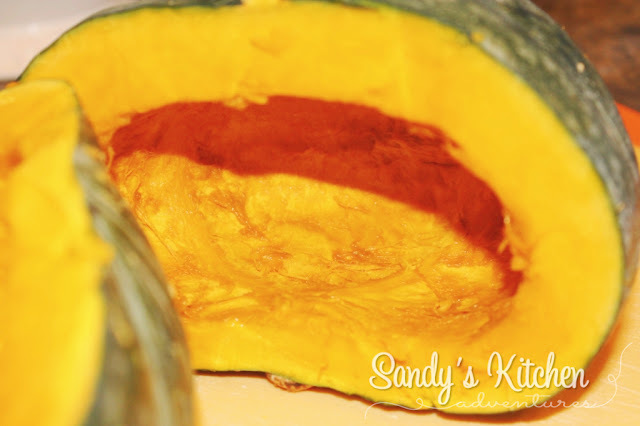 Add the 2 cups of squash to a blender. 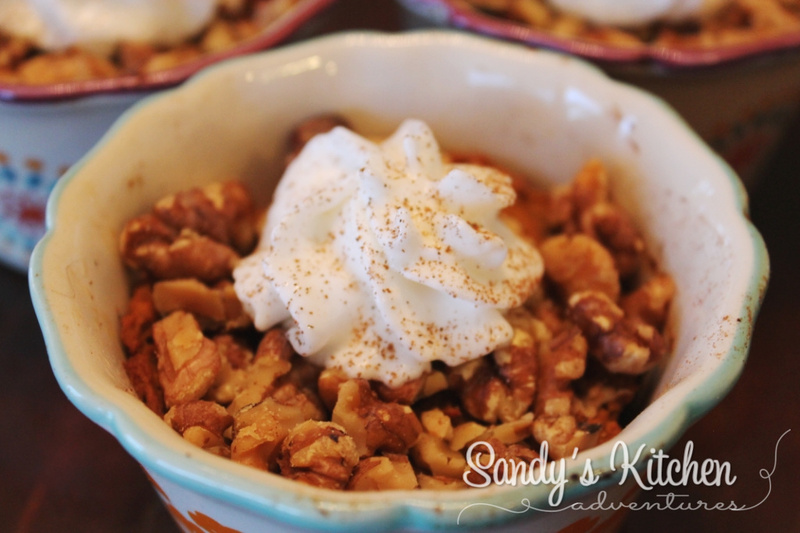 Then add all the other ingredients except the walnuts because those are for the topping. Some people have asked me my sweetened of choice. I love these little packets of stevia that I get from Amazon. There is no bitter aftertaste! We can all appreciate that! 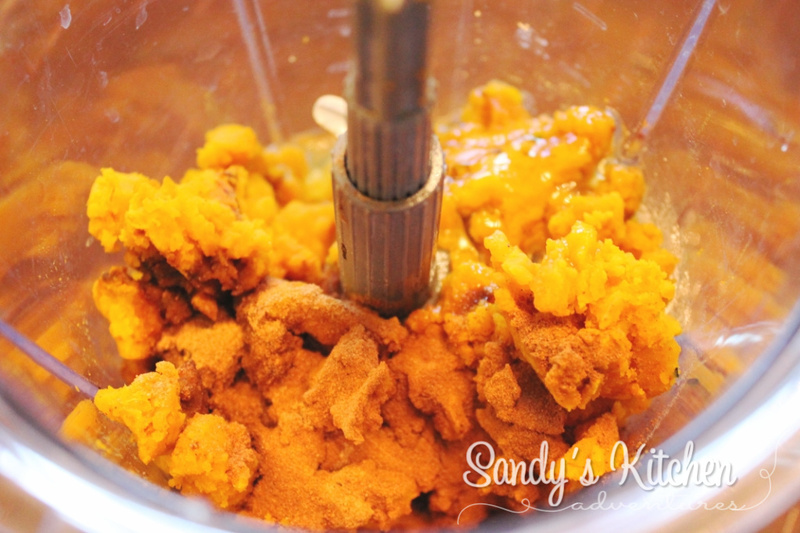 Once you have all your ingredients in the blender, blend until it is nice and smooth. If you need to add a little bit more unsweetened almond or cashew milk, please do so. I found 1/4 cup to be enough but some may like their pies to be a little less dense. Spray four ramekins with non-stick cooking spray. Evenly distribute the mixture into the ramekins. Bake at 425 degrees for 15 minutes. Reduce the temperature to 350 degrees. 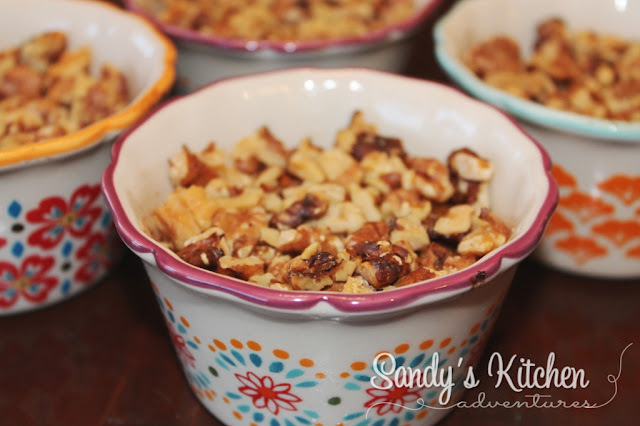 Remove the pies from the oven and add the walnuts. This is only an option of course. Seven walnut halves count as one optional snack on the Medifast plan, but I will tell you this... don't skimp on the nuts! 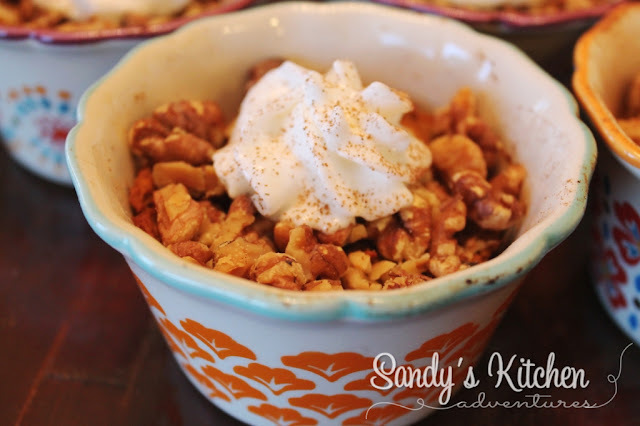 The walnuts get toasted right on the pies and their natural flavors are enhanced. It takes the place of a traditional pie crust, except it is on top of course, and you really just won't miss it. Not to mention walnuts are the only nut with a significant source of plant-based, heart healthy omega-3 fats. Or if you like, make one or two pies with the nuts and leave the nuts off on the others. That is what is so awesome when making individual pies! Let the pies cool and add a little bit of fat free reddi whip and a sprinkle of ground cinnamon, if desired. 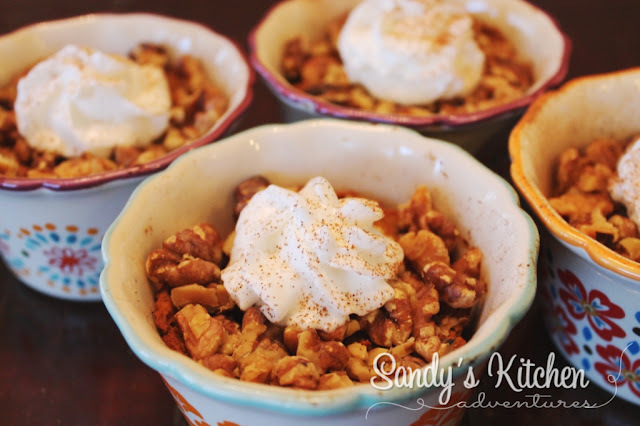 A heavenly dessert just in time for the holidays! Trust me when I say your house will smell like Fall when baking these desserts! 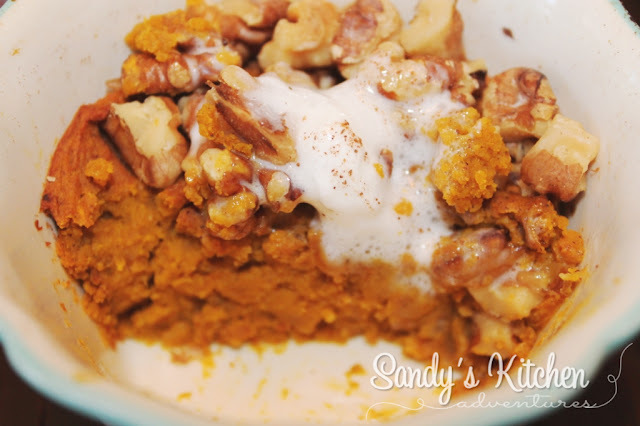 Who needs pumpkin pie when I have this healthier version? I know I don't! Enjoy!